Each November, the Santa Barbara community shows up in force to recognize and honor the local men and women who have served our country. The community is again invited to show their support at a number of patriotic Veterans Week events Nov. 3-11, hosted by Pierre Claeyssens Veterans Foundation (PCVF). On Saturday, Nov. 3, veterans, active duty military members, and their guests can dance the night away at the 22nd Annual Military Ball, 5-10 p.m. at the Hilton Santa Barbara Beachfront Resort, 633 E. Cabrillo Blvd. 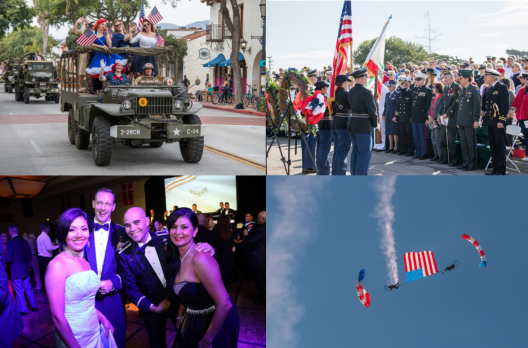 At the formal military ball, attendees can connect and celebrate during a lively evening complete with a cocktail hour, three-course dinner, dancing, and Excellence in Service tributes to those who have selflessly served our country. Guests will also have a chance to bid on historic artifacts and other items in a silent auction before the program begins. This year’s keynote speaker is Four-star Gen. Robin Rand, a U.S. Air Force general and former commander of Air Force Global Strike Command. Rand graduated from the U.S. Air Force Academy in 1979, obtained a MS in aeronautical science in 1988, graduated from the U.S. Air Force Fighter Weapons Instructor Course in 1990, and earned his MA degree from the Naval War College. He went on to become a command pilot with more than 5,100 flying hours, including some 480 combat hours, primarily flying the F-16, T-38, and T-37. Rand is the recipient of numerous military honors, including the Air Force Distinguished Service Medal with two bronze oak leaf clusters, the Air Medal with four bronze oak leaf clusters, the Defense Superior Service Medal, the Legion of Merit with two bronze oak leaf clusters, the Bronze Star Medal, and the Defense Meritorious Service Medal. He retired from the U.S. Air Force on Sept. 1 after nearly 40 years of service. Tickets to the ball are $150 per guest. To request an invitation, call 805-259-4394 or e-mail [email protected]. » On Saturday, Nov. 10, at noon, the Veterans Parade will make its way from the intersection of East Sola and State streets down to the Carriage and Western Art Museum of Santa Barbara at 129 Castillo St. This free, family event will feature World War II vehicles and re-enactors, and heroes from all branches of the military. » Also on Nov. 10, the 6th Annual Salute to Vets will take place noon-5 p.m. at the Carriage and Western Art Museum of Santa Barbara, 129 Castillo St.
PCVF and the Santa Barbara Veterans Foundation will host an afternoon complete with barbecue, live music, and military vehicles on display. Those attending can watch the Patriot Parachute Team perform in the sky. The show starts around 1:30 p.m., and the parachute team will make its landings in Pershing Park, just outside the Carriage Museum. Entry fee is $20 and includes five raffle tickets. Lunch is $10, or a package including entry, lunch and 10 raffle tickets can be bought for $30. Veterans, and children under age 12 are free. For more information, contact Jerry Farmer at 805-350-2006. » On Sunday, Nov. 11, community members can join the Veterans of Foreign Wars Post 1649 and Pierre Claeyssens Veterans Foundation for a Veterans Day ceremony, 10 a.m. at the Santa Barbara Cemetery, 901 Channel Drive. A keynote speaker and the Santa Barbara Choral Society will perform tributes for service members. For more information on all Veterans Week activities, contact Pierre Claeyssens Veterans Foundation, 805-259-4394 or email [email protected]. For more About Pierre Claeyssens Veterans Foundation, visit www.pcvf.org.